Although we ended up tied with Mesa at 26-12, they held the tie breaker against us. The fall season came down to the game against Mesa on Wednesday. Basically the winner of that game would clinch the division and go on to play Phoenix in the Fall Championship. Going into the 8th inning we were leading the deciding game. Unfortunately, we didn’t hold onto the lead as Slayden hit a grand slam to put Mesa up for good. It was a tough way to end the season. It’s not often in professional baseball that you get to play for a championship and when you fall just short, it stings a little. All in all though it was a great experience. It was an privilege to have been invited and I loved every minute of it. Playing for a team that scored so many runs in every game made pitching a lot easier. Although Mesa went into the championship game as the clear favorites(on paper), they fell to Phoenix 10-4. Phoenix has now won the league 5 years in a row. I’m not sure how that has happened because of all the great talent out here, but somehow that team seems to put it together at the right time. I also enjoyed writing to all you fans out there and I want to thank you all for your questions and comments. Now it’s time for some time off and rest. There are only a couple months until the next season starts. Until next year, take care all! It’s crazy to think we have been here for almost a month and a half already, but we are down to the final two weeks of the fall season. With only 10 games left we lead Mesa by 1 game. Everyone who was chosen to play in this league was exciting to be here, but now we want to win this thing. We have been on a roll lately only losing 2 in the last week. Our last loss came to the Scorpions in dramatic fashion when we gave up 7 in the top of the ninth. We were trailing 16-10 in the bottom of the ninth and managed to push across 5 before a deep fly ball to the warning track ended the game. We have a change of pace this week as we will play in three night games this week. During the World Series there aren’t any night games so that everyone can watch the WS games. Now that it’s over night games have started back up. We played one night game last week which resulted in a loss. I believe our first home night game is coming up this week as well. The weather here in Arizona is starting to change a bit. I saw rain for the first time today here in Phoenix. The temperature has been dropping rapidly at night as well. Night games get a bit chilly which should be expected in November. Looking back on the year, this has been a very long season. Although I had a few weeks off in between the regular season and the AFL, I had to keep my body in shape. This is certainly the first time I’ve played baseball all the way into November, but I’m not complaining. But I will enjoy giving my arm a break during the off season. Surprisingly, my arm feels great despite the stiff shoulder at the beginning of the AFL season. Well that’s it for now. Hopefully by the next post we will still be in contention for the playoffs. Until then, take care everyone. Thanks for reading! 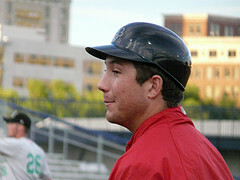 Howdy everyone this is Brad Furnish of the St. Louis Cardinals currently playing for the Peoria Saguaros in the AFL. I’ll get started by giving you some background information about myself. I was born in Wichita Falls, Texas and I am currently 23 years old. I graduated from Allen High School in Allen, Texas, a suburb north of Dallas. I received a scholarship to the University of Nebraska, after one year I transferred to Texas Christian University and spent two years playing for the Horned Frogs. While in college I was fortunate enough to spend my summers playing for the Wareham Gatemen in the Cape Cod Baseball League. I was also fortunate enough to win two conference championships and participate in two regionals while at TCU. I was drafted as a left handed pitcher by the St. Louis Cardinals in the 2006 draft and I have played at four levels since joining the organization, most recently with the Springfield Cardinals of the Texas League. One of the biggest highlights for me since joining the Cardinals was being able to throw the first pitch in the history of the State College Spikes, which was our short season A affiliate in 2006. That was a great start to my professional career and I am hoping for more great things to come. I am really excited to have the opportunity to play in the Arizona Fall League. I had heard great things about this league and it has definitely lived up to the hype and then some. I was told to use this as an opportunity to not only to face some of the best competition in baseball but also use it as a time period to make some adjustments and learn more about the game. With that being said I am currently working on making some mechanical adjustments within my pitching motion. The goal is to make the movements a little more quiet and smooth. I have been able to connect with the coaches out here and their insights are allowing for the transition to come along quickly. We have been playing for a little over four weeks now and I am really impressed with how our team has come together. We have been playing real well and hopefully we have a chance to play for the championship. It is always exciting to have something to play for, especially when you are playing with players as talented as the ones out here. Happy Halloween from Peoria, Arizona. Today we had a 12:30 game against Phoenix in which we won our 3rd game in a row. The score was 11-3 and seemed to be over early. It’s not often that we see many games involving a pitching duel. However, we played in a 3-2 game against Surprise on Oct 30th. I haven’t gone back to look at the scores, but I would say it is common for one team or another to score at least 10 runs in a game. There have even been a few games where upwards of 30 runs have been scored between both teams. It is simply enjoyable to watch all these great hitters during the games. I would say it’s like facing an all-star team during every game. I’m certainly having a great time out here on and off the field. I feel great physically after a little shoulder stiffness. There have been a few injuries here and there and I hope those guys can get healthy before spring training. I want to thank those again who read these blogs and follow along with the AFL action. When I was growing up, Tom Glavine was always the pitcher I looked at as an idol. I wouldn’t say that we have the same pitching styles, but him being a lefty and also very successful throughout his career was always very insperational. In our system, there are a couple pitchers who have made a very quick climb including Jess Todd and Clayton Mortensen. Both of these guys have already had a lot of success after their first full year of professional baseball. Before the season ended, I was given a few things that my pitching coaches wanted me to work on. My biggest focus is trying to control my 2-seam fastball. When it comes to facing hitters at higher levels, I’ve learned that you can’t change the way you approach or pitch to hitters. Instead, I just hope to throw strikes and keep the ball on the ground. Well thats all I have for now. I hope everyone has a great Halloween. Thanks again for the comments and questions, keep them coming. I also stated in my last blog that I had not yet thrown. Well I have been a part of 2 games now and both out of the bullpen. Although I was moved to the rotation during the year with Springfield, I will be coming out of the bullpen for the duration of the AFL. If any of you readers ever have any questions or comments, don’t hesitate to leave them for me to answer. Thanks again to all you AFL fans following the games and blogs. Until next time, take care! For those of you who left comments on my last blog, I want to get to your questions. First off I want to thank you for reading and keeping up with the lastest AFL action. This year, I started off in Low-A which was located in Quad Cities IA and ended up in AA Springfield IL. For most of the year I came out of the pen in different roles such as long relief, lefty vs lefty, and even some set up and closing roles. I throw a 2-seam and 4-seam fast ball, curveball, changup and I’ll also drop down and throw a fastball and slider at a side arm angle. Although I don’t throw exceptionally hard, I am able to get a lot of strikeouts by changing speeds and hitting my spots. I would say that in a tight situation I would go to my change up as my “out” pitch to get the strikeout when I really need it. As for getting sent to the Joliet Jackhammers, I went undrafted after my 2007 senior season and I still wanted to continue playing. A player representative for a number of independent league teams gave me a call after I went undrafted. My pitching coach from college was able to put me in contact with the player rep at which time he set me up with the Joliet Jackhammers. Thanks again for reading and for supporting the AFL. Greetings fans, I will be representing the St. Louis Cardinals in the AFL blog. First off, let me introduce myself. My name is Justin Fiske and I am from College Station, Texas. I played high school baseball there for all four years and then moved onto Richland Junior College in Dallas Texas. I spent two years in Dallas and was part of a championship team in 04′. I then went to Texas State for my final two years in college. I went undrafted in 2007 after my senior year, but was still determined to keep playing. 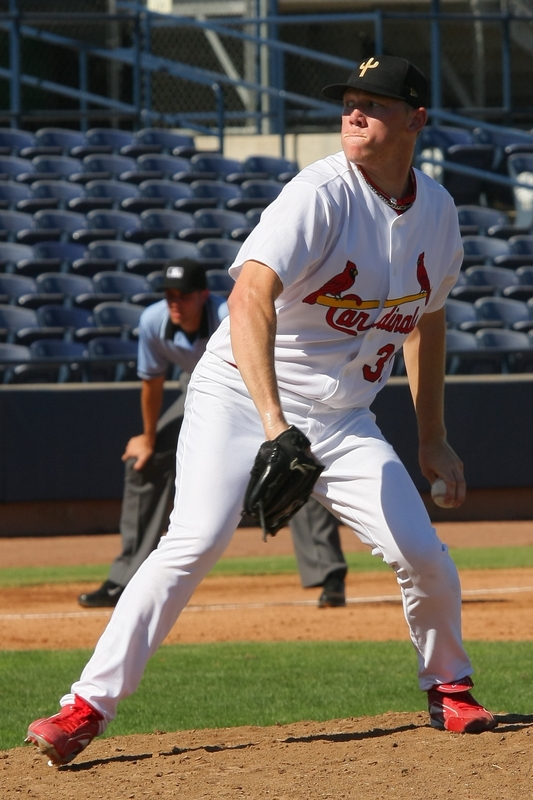 I was picked up by the Joliet Jackhammers of the Northern League and was soon after signed by the St. Louis Cardinals. This past season was my first full season of professional baseball and I’m excited to continue the season by playing in the AFL. We all arrived here on the first of October knowing that we had a week of practice before games started. It was a great opportunity for everyone to meet and greet and get all the kinks out. It’s exciting to see so much talent from different organizations playing on the same team. Our coaching staff is also made up from the five organizations which gives players different perspectives of how other teams function. In the season opener tonight, we defeated Scottsdale, 9-3. It didn’t take long to see how high the talent level was in this league as Chad Huffman blasted a home run in the first inning. The game was close until the ninth, when we scored four to give us a six-run lead. Now that the season has started, hopefully the next entry will be filled with more baseball action. But until then if any of you readers have questions you would like me to answer feel free to leave a comment and I’ll be sure to get to those in the next entry.